Our American Made Safety Banners are used by over 11,000 Safety Professionals! Made in Memphis, Tennessee. Great people making Great products you can trust. ANY Image - ANY Size - ANY Product - it's that simple! NOTE: Our products are the tabs across the center of the price/order page. Very large safety banners, down to very small safety posters and many choices in between. Why we are so different - SafetyBanners.Org is the ONLY safety banners manufacturer who can take ONE image and make it into a variety of product types. It doesn't get more simple that that. No more finding an image you like, but the size is wrong or you can not get it on a product you want! That is our goal - keeping safety awareness simple - SafetyBanners.Org. Plus, we can make any product ANY SIZE on a custom order basis - just ask. 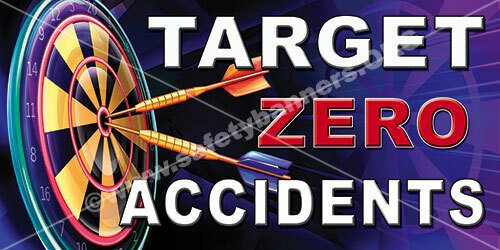 Premium Safety Banners, Fence Banners, Vertical & Horizontal Posters, Floor Safety Stickers / Signs, Wall Decals. PLUS, the world's largest collection of OSHA VPP Safety Banners product and Seasonal Safety Banners products. Senior Management, CEO's and even the OSHA boys love our safety banners because we keep safety reinforcement simple - that is what we are trying to do here with our safety banners and safety posters. ANY image or safety slogan can be used with ANY product. 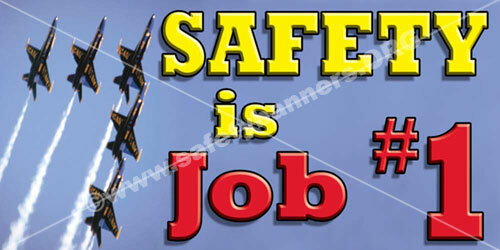 ANY of our safety slogans or safety banner graphics can have your company logo. We can make any of our safety graphics ANY Size - from avery very large safety banner product (we can actually go as big as 300 feet wide by 150 feet tall) to very small safety poster product. Safety professional after safety professional and even OSHA personnel have told us that constant safety awareness reminders is one of their hardest problems. As human beings, we need constant reminders to help change our behavior and attitude. Part of the SafetyBanners.org goal is to help you reinforce the need for safety and safety awareness in your people and create an environment where Safety Awareness is top of mind all the time. That is why our industrial safety banners and work safety banners are the most vibrant and colorful on the market. Our Seasonal Safety Banner Collection. Now safety awareness has seasons, just like the year. Click our NEW SEASONAL button above left and have a safe and happy season. 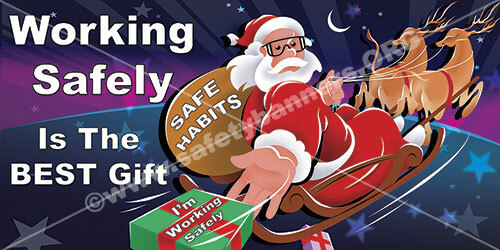 Safety slogans on safety banners help involve employees and keep them thinking safety. Even just one safety slogan on one workplace safety banner can help. In fact, if it were not for the help of one safety professional, Rich Suidy at Insulfoam, we would still be a minor player in the safety business, rather than the largest producer of safety banners in the country. Thank you Rich. We are in your debt. We offer many more products other than just industrial safety banners and work safety banners. See our complete product offering on our price and ordering page. Digital Banners - We are one of the largest digital banner manufacturers in the U.S. producing thousands of banners a year. We have had safety banners survive hurricanes Katrina, Gustav and Ike. That is how strong our material is. Some people call us SafetyBanner.Org or SafetyBanner.org, in the singular. However, our name is actually SafetyBanners.Org, in the plural. But that is OK. The SafetyBanner.Org url will take you to straight to our site. Important Note: safetybanners.com, mysafetysign.com & safetybanner.com is a company that makes labels and decal products and also sells banners as a sideline and is NOT us. We are safetybanners.ORG. Unparalleled quality and selection from SafetyBanners.Org.